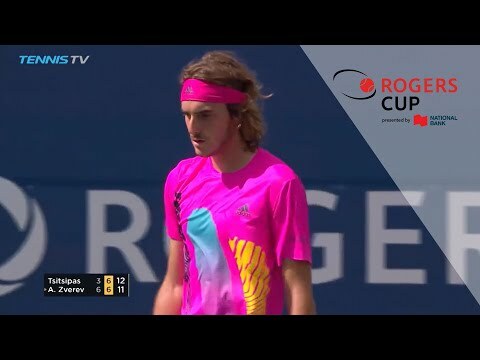 Welcome to Road to Rogers Cup, the weekly roundup of all the action on the ATP Tour ahead of the 2019 Rogers Cup presented by National Bank at IGA Stadium from August 2 to 11. This week, we’re running through the Australian Open, which crowned its 2019 champions last weekend. For the last two weeks, tennis fans were transfixed by the Australian Open, the season’s first Slam. Striving to impress in Melbourne’s scorching heat, the players nearly made us forget the snowstorm that hit in our neck of the woods. When all was said and done, 31-year-old Novak Djokovic substantiated his World No.1 ranking with a 6-3, 6-2, 6-3 win over Rafael Nadal (2). In the final, the Djoker was flawless with only nine—yes, NINE—unforced errors. Fans eagerly awaited the clash between Nadal and Tsitsipas but ended up disappointed when the Spaniard pulverized his opponent in three (6-2, 6-4, 6-0). As for Djokovic, he dropped a set in his third- and fourth-round matches against Shapovalov and Medvedev. He then breezed through his duel with Kei Nishikori, who was forced to retire, and knocked out Lucas Pouille (6-0, 6-2, 6-2). Alexei Popyrin and Alex Bolt, Australian heroes. Alexei Popyrin, who entered the Australian Open as World No.149, ousted Mischa Zverev and Dominic Thiem (7-5, 6-4, 2-0, ret.). In the third round, he fought a five-set battle against eventual semifinalist Lucas Pouille—quite a feat! No. 155 Alex Bolt showed Jack Sock the door and overpowered Gilles Simon in five tight sets that had fans on the edge of their seats. Three short years ago, Bolt was out of the Top 500 and played …football! Frances Tiafoe makes a quarterfinal appearance. The 21-year-old American—who had never made it past the third round of a Slam—took the tennis world by surprise when he made a beeline for the quarterfinals in Melbourne. Tiafoe booted out World No.5 Kevin Anderson, Andreas Seppi and Grigor Dimitrov and is definitely one to watch this season. The end of the road for Andy? Three days after announcing his retirement at the end of the season, Andy Murray played one last match in Melbourne. At the end of a bitter four-hour struggle against Roberto Bautista Agut, the former World No.1 fell in five sets. “If today was my last match, it was a brilliant way to finish. I literally gave everything I had on the court, fought as best as I could,” he admitted after the loss. Next weekend, teams across the globe will face off in the Davis Cup by BNP Paribas qualifiers. Who will make it to the finals in Madrid? Stay tuned! Canada was well represented in Melbourne. Félix Auger-Aliassime, Brayden Schnur and Peter Polansky didn’t find their way into the main draw, but Denis Shapovalov and Milos Raonic were accounted for. In the third round, Shapovalov went head-to-head against Novak Djokovic and lost in four (6-3, 6-4, 4-6, 6-0). In the quarters, Raonic was caught off guard by Lucas Pouille after expelling Alexander Zverev (4) in the earlier round. Road to Rogers Cup : Who will take top honours at the Australian Open? Jan 15, 2019 Road to Rogers Cup : Who will take top honours at the Australian Open?